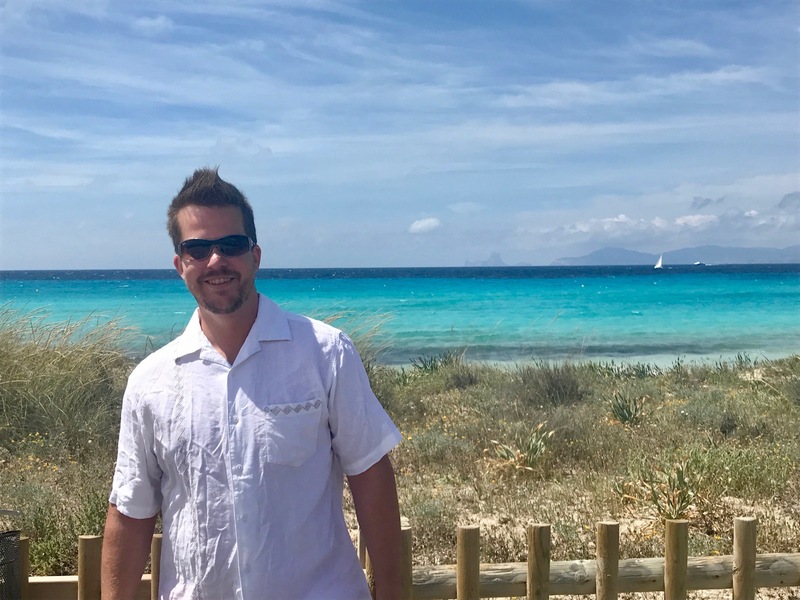 While browsing through various travel blogs some time ago, I discovered an article about the powdery-soft, often pinkish beaches of a place called Formentera. Upon further googling, the crystal clear, calm waters and rose-hued sands immediately left me eager to visit. 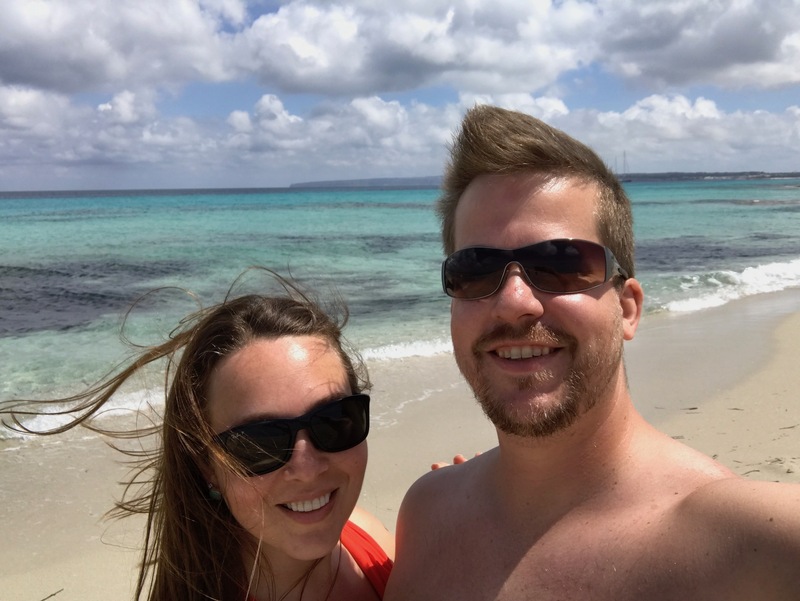 I finally got that chance when Joe and I visited Ibiza, and our trip to the tiny island was just about as dreamy (and adventure-filled) as I hoped. 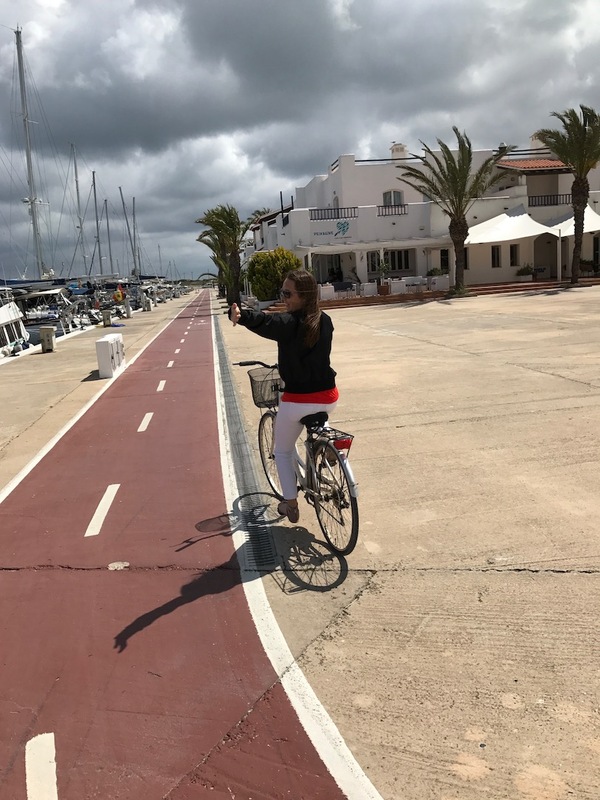 How does one get to Formentera? By ferry, of course. We were promised a quick, 40-minute trip after pick up at the dock directly in front of our hotel – how convenient! Little did we know, however, that different ferries traveled to the small island at different speeds…but how were we to know? When we hopped on the ferry (was it the right one? It didn’t match the name on our tickets, but it was at the right place sort of at the right time…) and climbed up to the upper deck, I had visions of cruising along briskly, blunted bow tidily breaking the small wavelets on the way to Formentera, and then arriving 40 short minutes later, refreshed and ready to explore. Well, let me tell you: that’s not how it went. We were joined on the upper deck by about 10 other poor souls who also seemed unaware of what was coming. Everyone settled in various degrees of sprawl/fetal position on the slightly battered and worn white leather ottomans serving as seats (it struck me as odd until I remembered that our boat was titled the “Summer Party Pleasure Cruiser” or something similar) clad in summer clothes. Once the ferry set off and opened up in the increasingly choppy, swell-filled water, however, passengers gradually started draping, then frantically wrapping on every layer of clothing in their beach bags. 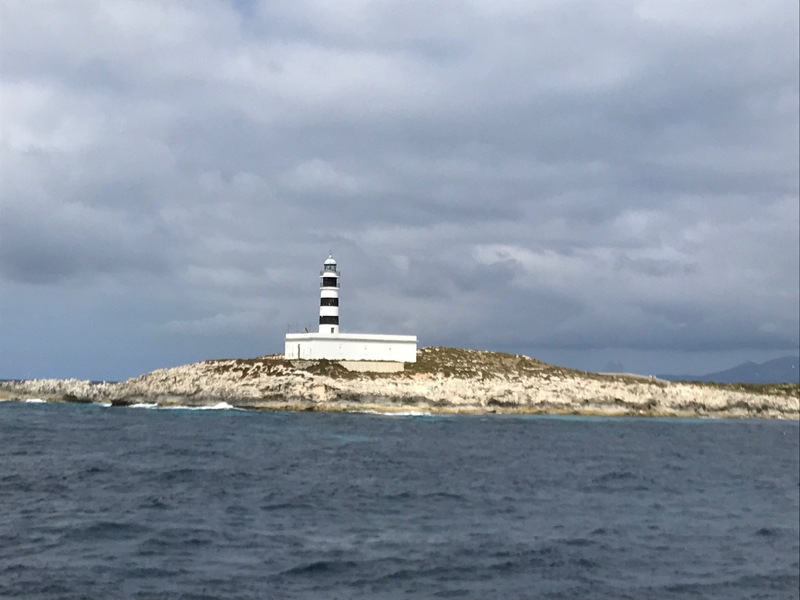 As we crept towards Formentera – we quickly discovered the slow pace of our craft – our hair became more wind-blown and our fingers more chilled. When we finally reached the port (one and a half hours later!!) we were only too glad to disembark and thaw out. Now the fun could begin – or so we thought. Fortunately, we had arrived and found the scooter rental shop right before another fairy bursting at the gills with millennials all chomping at the bit to rent their Instagrammable bikes and head to the beach. As we filled out our rental form, we realized we hadn’t brought our international driver’s license (or any license at all). Begrudgingly, we settled for the old-school road bikes of questionable stability and set off towards the nearest beach (which also happened to be one of the best). After remembering how to ride a bike (they’re wrong, you can almost forget) we made our way down a narrow, rocky bike trail which skirted a limestone-encrusted coastline lapped by the most incredibly clear, turquoise water I’ve ever seen. 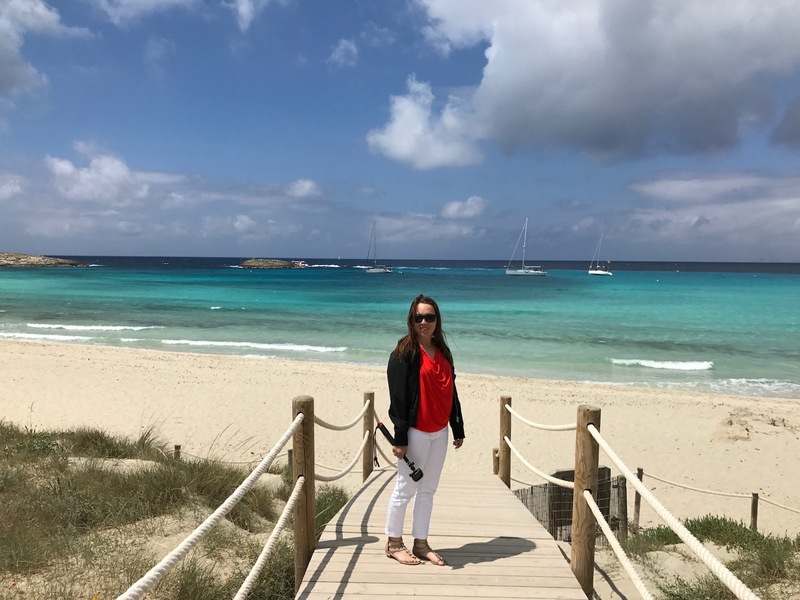 We meandered along the narrow spit of land stretching out from Formentera towards Ibiza, snapping photos and taking videos. Finally, at the end of the trail, we locked up our trusty steeds and hiked a short way down to one of the loveliest, most peaceful beaches I’ve ever seen. Scattered sunbathers sprawled here and there, but the beach was almost deserted. The sand was so soft it stuck like flecks of pulverized plastic to our skin as we settled in for some much-needed rays. To one side of us, an extremely tan, extremely attractive mother in a crocheted bikini corralled her three children and husband while managing to look incredibly relaxed and chic, and on the other side, a beautiful pregnant woman and her husband cuddled and sunbathed. I wandered down to the water to take some photos, but almost jumped out of my skin when an icy cold wavelet swirled around my toes…it’s not summer yet! After soaking up as much late spring sun as our bodies could handle, we biked our way back to town. Just a word of advice for those seeking to eat at one of the upscale restaurants with a view along the beach: reservations are needed. We were unaware. By the time we made it back to town I would have settled for a piece of bread and a can of tuna, but we stumbled upon a quiet little café off the main street that served straightforward yet elevated comfort food and cheap, good wine. #Winning. Last bit of the adventure: discovering which ferry would carry us back to Ibiza. 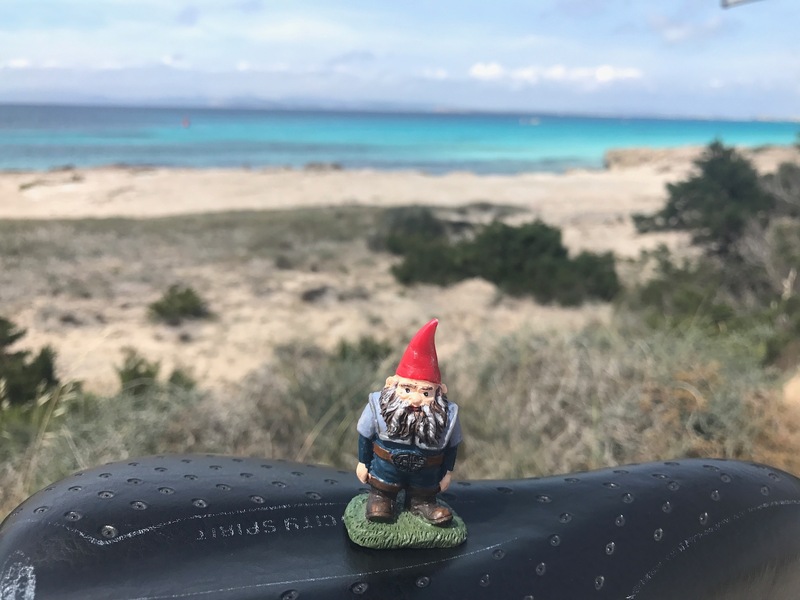 Hint: it wasn’t the same one that brought us to Formentera (thank goodness, but also – confusing)!! Luckily we wandered down the dock (following a few windblown souls we’d seen on the ferry ride out) just in time to hop on a small, low boat which jet-propelled its way through large swells and delivered us back to the dock in a mere 38 minutes. What a ride, and what an adventure!